Merchandise - Genealogy Friends of Plano Libraries, Inc.
We now have tote bags!! They are available at Saturday Seminars for $17.00 each. 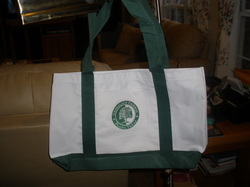 The bag is white with dark green trim and handles with our green logo. Be one of the best-dressed genealogists in town! To order a shirt, download the order form and return it to a Saturday Seminar with your check. We will let you know when it has arrived and available for you to pick up at a Saturday Seminar.